Our double-sided post cards are tailored to fit your personal message. Do you want to say thank you for an audition? Announce a new booking? Invite agents to see a show? The $25 setup allows you to choose up to 2 photos for the front and 3 for the back. For no additional charge, we'll Rock Your Postcard and create a custom design just for you. 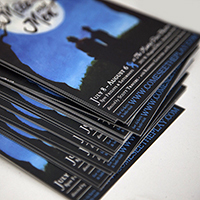 Post cards are printed on cardstock using an offset printing process. Cardstock items are typically processed in 2-6 business days after the proof is approved, and SHIPPED FREE via UPS Ground (domestic only).